Hi, there. I was going to try to put this delicately, but let’s not mince words. I need a solid. See, I’ve got this serialized story over at Amazon.com. It’s called Dr. Nekros: The Tragedian and it’s the first part in what will ultimately be an eighteen part series. I know people have been buying it, and that’s awesome. I get to follow its sales rankings, so it’s not doing too badly, and I really appreciate everyone’s support. But, it’s been proven that products at Amazon.com that have been rated and reviewed tend to do a little better than those that haven’t. That’s where you come in (I hope). If you’ve read Dr. Nekros: The Tragedian, I would appreciate it so much if you would take a minute and give it a quick review. Just a few sentences, a short paragraph. Heck, even if you hated it, something is better than nothing, right? Don’t get me wrong, though, I like those positive reviews. So, that’s the favor I’m asking of you. I hope it’s not too much, and I really can’t offer anything more than my gratitude. As always, your support of my dream means the world to me. You can find Dr. Nekros: The Tragedian by clicking here, then scroll a ways down to a button that says “create your own review.” After that, sky’s the limit. 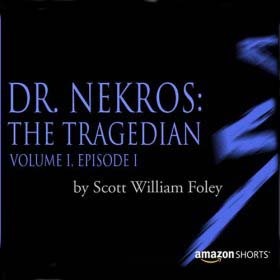 This entry was posted in Opinions/Editorials and tagged Amazon Shorts, books, Dr. Nekros, Dr. Nekros: The Tragedian, entertainment, serialized short stories.